Winter cutworm is a new pest threat in this region. It has a wide host range and can be very destructive because it moves and feeds in large masses, similar to armyworms. As the name implies, cutworms are active during the winter, and therefore can affect perennial and fall-seeded crops including legume and grass cover crops, grasses grown for seed, ornamentals, vegetables, and grains. 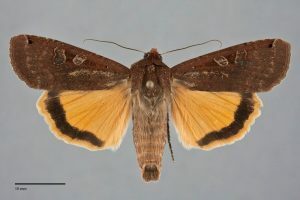 Between November 2015 and February 2016, dozens of reports were made throughout Oregon and Washington, where there was suspected damage from winter cutworm, which is the immature, damaging stage of the large yellow underwing moth. Adult moths have been present in this region since 2001, yet there had never before been accounts of widespread damage being done by winter cutworm. In response, an OSU Extension publication was released (available here), and public presentations were made in Multnomah, Polk, Linn, Benton, and Douglas counties. Adult moths have been very abundant over the past few weeks. They are easily recognizable by their large size (~2″) and hindwing, which is bright orange-yellow and bordered by a thick dark band. We are currently researching whether winter cutworm will be a problem again in the months to come. If you have seen this moth, please comment below or contact jessica.green(AT)oregonstate.edu. © 2019 Cutworm Central, all rights reserved.